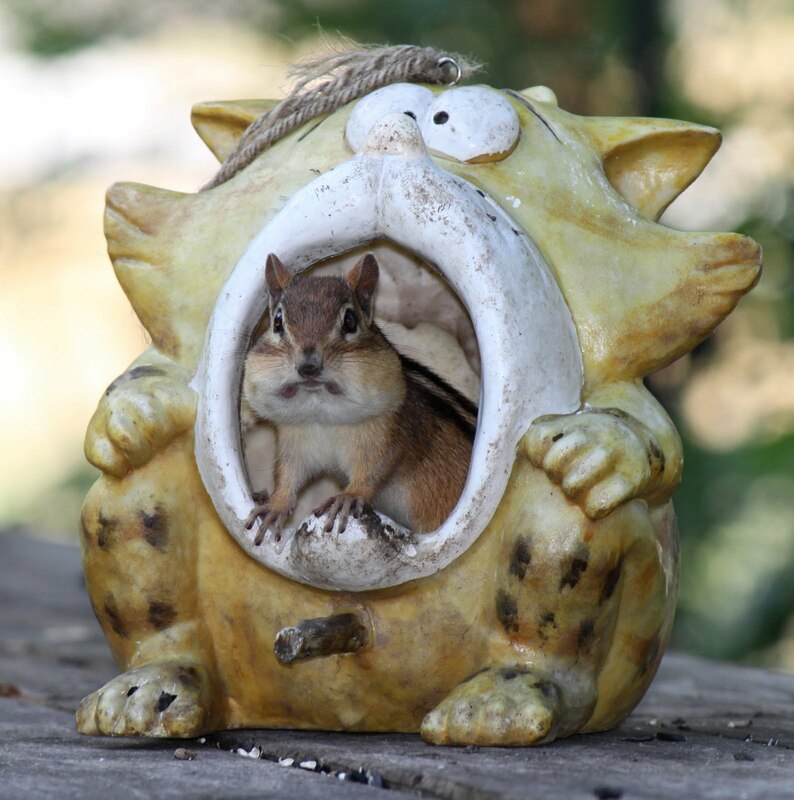 Our two resident Chipmunks kept us very entertained in the backyard this weekend. Our long weekend didn't get off to the start it was suppose too, but it was a good one regardless. Saturday morning had us up bright and early, picnic packed to head to the Muskoka Wildlife Centre near Gravenhurst to pick up our sponsor package for Luna, a Saw-whet Owl who lives there. 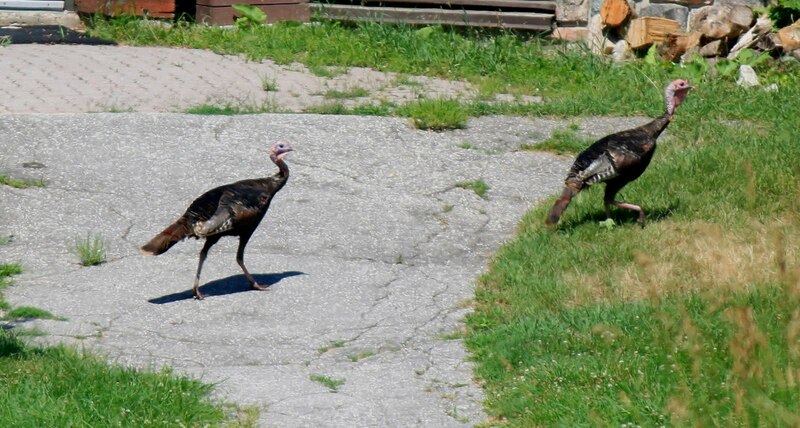 We wanted to enjoy a visit to the nature park and it's residents. The 400 highway was a nightmare, stop and go traffic. After spending almost two hours, more then the amount of time it should take to get there, and not even being halfway there, we decided to turn around. I was devastated. I had been looking forward to this trip for weeks and I had a complete meltdown. Rob pulled over in a small town to console me, we got a bite to eat and talked about when to go back and what to do with the rest of the day. We decided to wait and go back to the Muskoka Wildlife Centre on September 15th, Rob's birthday, on our way to Algonquin for a couple nights. We planned on stopping in then anyway to re-sponsor Silo, a Barn Owl, and we will pick up the sponsor package for Luna then, and hopefully see them both. We then headed to Albion Hills, a conservation area Rob had visited earlier in the week. He had had some good bird sightings there. It was a good idea. 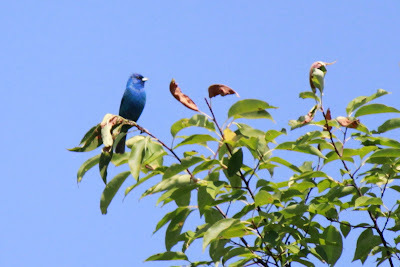 I was able to see three male Indigo Buntings, first sighting for me this Summer and also three Wild Turkeys which are always fun to see. 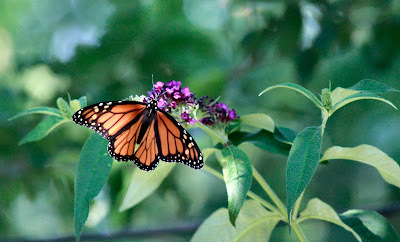 We enjoyed our visit there and were amazed at the amount of Dragon Fly's buzzing around. A beautiful male Indigo Bunting was a joy to see. Wild Turkeys are always a treat to spot when birding. After we left there we went to the Humber Arboretum, a place we frequently visit, to enjoy our picnic. After lunch we went into the visitor centre and one of the guys gave us the "reptile tour", and let me hold a Red-eared Slider named "Cleo" and we both got to hold a Chinese Water Dragon named "Yoda". It really lifted my spirits. Enjoying the picnic lunch at the Humber Arboretum. 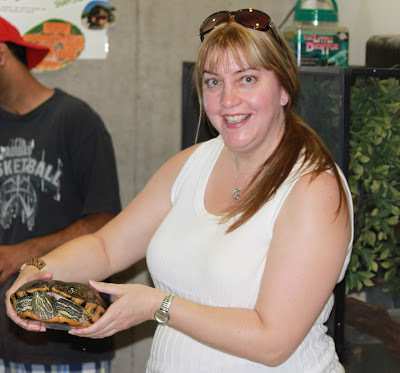 Me holding "Cleo" a Red-eared Slider Turtle, she could really motor on the floor! Rob holding "Yoda", a Chinese Water Dragon. We then spent the rest of the day enjoying the backyard, which we did most of the weekend, except for going to a friends place for a BBQ Saturday afternoon, early evening. The birds, including this Blue Jay were loving the bird bath this weekend. The Monarch Butterflies were plentiful in the backyard this weekend. Enjoying my first corn on the cob of the season at a friends BBQ. I loved the hammock at a friends place! Must get one for our yard! Even though we didn't do what we had planned to do Saturday, we ended up having a great day. Spending most of the weekend in our backyard was enjoyable and just what I needed after a stressful week at work. And, I've just been informed that we're going for an ice-cream!, Now that is a great way to end a long weekend! That's too bad that your day didn't go as planned but it sounds like it turned out okay after all. 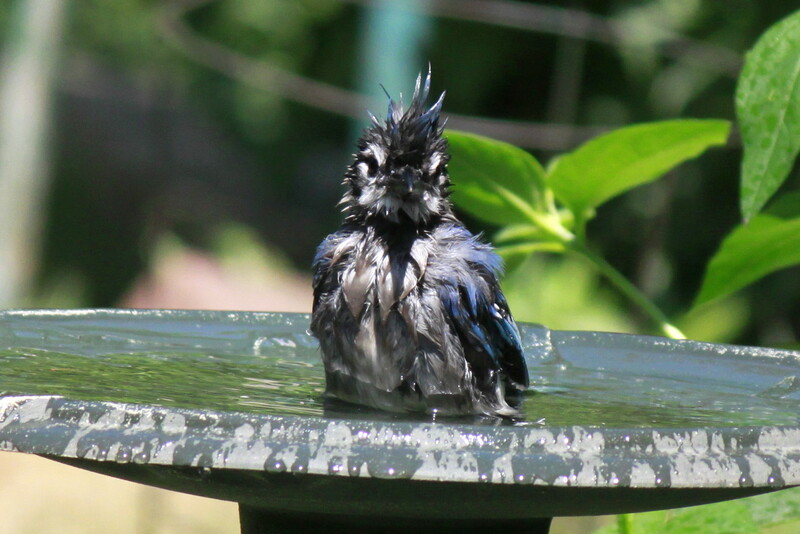 Great shot of the blue jay in the birdbath!